2007 Bay Iberian Warmblood Mare by Multi-National Champion PRE stallion, Kianto (Jackass Mountain Ranch), out of our imported, Hanoverian mare, Primavera. Ariana is a picture of the ideal Dressage horse. She has excellent conformation, with great bone mass and muscle length. Her movement and suspension are exceptional. She is very intelligent, quick to learn, and enjoys engaging with humans. She has an elegant presence about her that demands attention. She will be an exceptional show horse. Ariana is a very sweet, respectful mare with excellent ground manners. She is a pleasure to be around. Ariana’s sire, Kianto, comes from a long line of Spanish Champions, carrying the bloodlines of both Temerario V and Genio III. Ariana’s dam, Primavera, came out of some of the most prestigious Dressage and Jumping bloodlines that Germany has produced (Pik Bube, Pik Boy, & Canaris). Primavera was imported to the United States as a competition horse and we had the pleasure of having her here as a broodmare until the end of her life. She was a wonderful, talented mare, and is sorely missed. Fall of 2009 we started Ariana in long lines. She has proven to be an excellent student, sensitive and light on the line. She is the classic extrovert, always letting us know what she thinks and where she is at in what we are asking of her. Ariana began her formal training under saddle June of 2010. She transitioned under saddle beautifully, impressing us with her bright mind and strong work ethic. 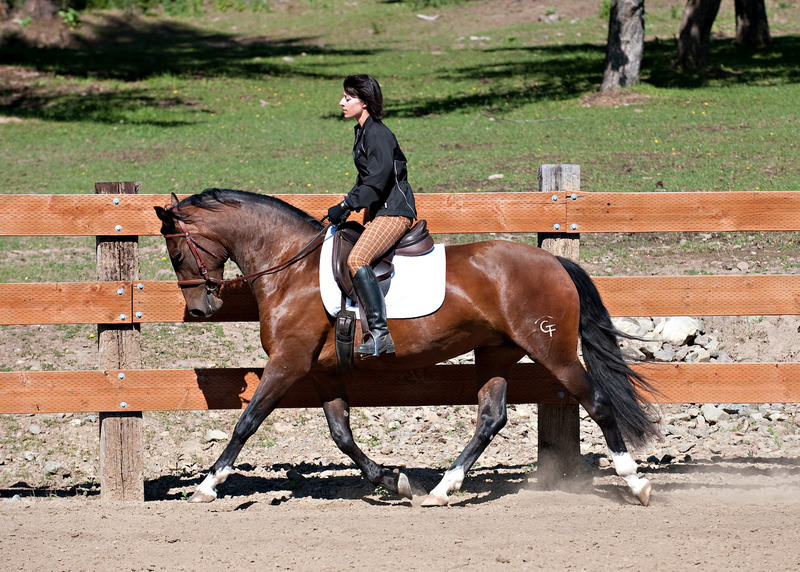 She has three solid gaits, moves straight, and has wonderful lateral ability. She is learning to move forward feely, and has proven to be quite tolerant of a variety of situations. She is not a nervous or spooky horse. We are currently riding her 5 days a week for one hour a day. We have been very pleased with her progress. Now at four, Ariana is really beginning to develop good natural impulsion and forward motion. She is physically and mentally maturing beautifully. We have ridden her in two clinics this spring, one with Andre Ganc, in from Brazil. A second with Frank Grelo, a Portuguese classical trainer, here from Cananda. Ariana performed well, staying focused and working hard. It is a pleasure to see her progress so well under saddle. We look forward to riding her this season in her first Dressage show.